Our recommend an international footballer campaign seems to be going well. 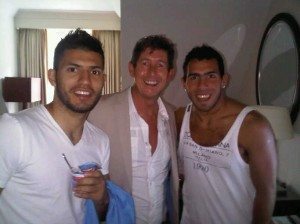 It’s only weeks since we first cut Sergio Aguero‘s hair and he’s already been back with his Manchester City team mate Carlos Tevez. It seems we’re quickly becoming Manchester City’s unofficial hairdressers and that’s fine by Peter who couldn’t be more thrilled with his new mates!